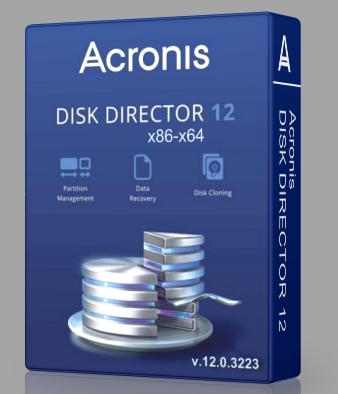 Acronis Disk Director 12 – это новая версия самого функционального продукта для управления дисками. Если вам нужна максимальная производительность дисков и безопасность данных, этот пакет предлагает лучшие инструменты для создания, изменения размеров, переноса и объединения разделов без потери данных. Acronis Disk Director 12 предлагает новые мощные функции – поддержку Windows 8, поддержку динамических и GPT-дисков, распределение томов по нескольким дискам, поддержку WinPE 4.0 и WinPE 5.0, поддержка машин на основе UEFI и многое другое. • Manipulate. Manage your data, whether you are splitting, resizing, converting or merging volumes. Create, convert and copy files and volumes as needed. • Partition. Mapping hard drives and creating partitions are made easy, allowing you to do more in less time. Format, label and make your partitions active in one easy step reducing time spent and risk of errors. • Format. Let Acronis Disk Director make complex operations easy and more efficient with an intuitively designed user interface. Format your drive with the correct file system, whether FAT16, FAT32, NTFS, Exts, Ext3, Reiser3, Linux, SWAP. • Recover. Volume recovery is an easy to use tool that lets you recover volumes that were accidentally deleted or damaged due to a hardware failure. • Install. The ability to SPLIT your existing single volume into two volumes, and install a second operating system into the second volume. • Convert. As your requirements change, you can quickly convert between basic and dynamic disks in just moments. • Span. Span volume across multiple physical disks – Supports up to 32 disks. • Access. Acronis Disk Editor allows direct byte accessing and editing capabilities on your disk. • Boot. Boot from a CD/DVD or USB drive without having any operating system installed.